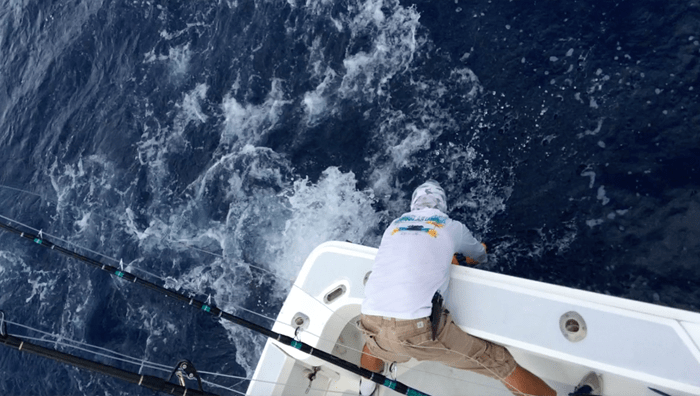 PUERTO JIMÉNEZ, Puntarenas — Forty miles south of the Golfo Dulce in the open Pacific Ocean, a 200-pound blue marlin was about to have the worst day of its life. And I was about to have one of my best. Capt. 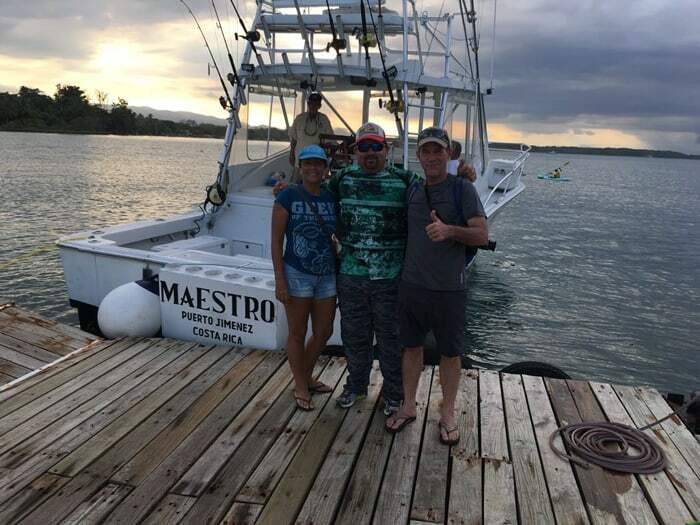 Oscar Villalobos picked us up at Crocodile Bay at 6 a.m. with first mate Jesús and three friends, and we motored past Matapalo for an hour and a half until we got to “the Marlin Hole,” which Oscar said doesn’t have a name, which is why I just gave it one. 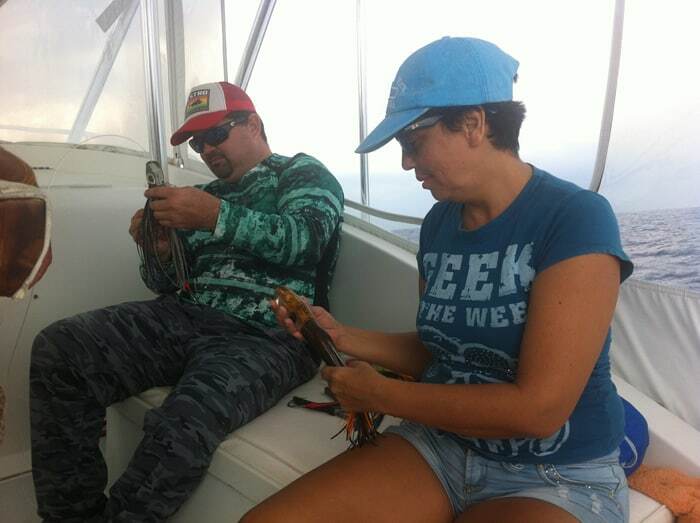 At first we tried trolling with big lures, then we jigged for some little tuna to use as bait. A nice fat yellowfin was seduced by our plan, and we unkindly returned it to the sea impaled on a hook. 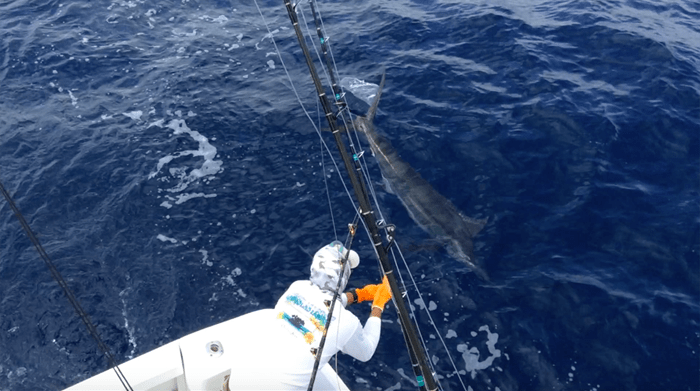 The next fish to stumble into our trap was our 200-pound marlin. 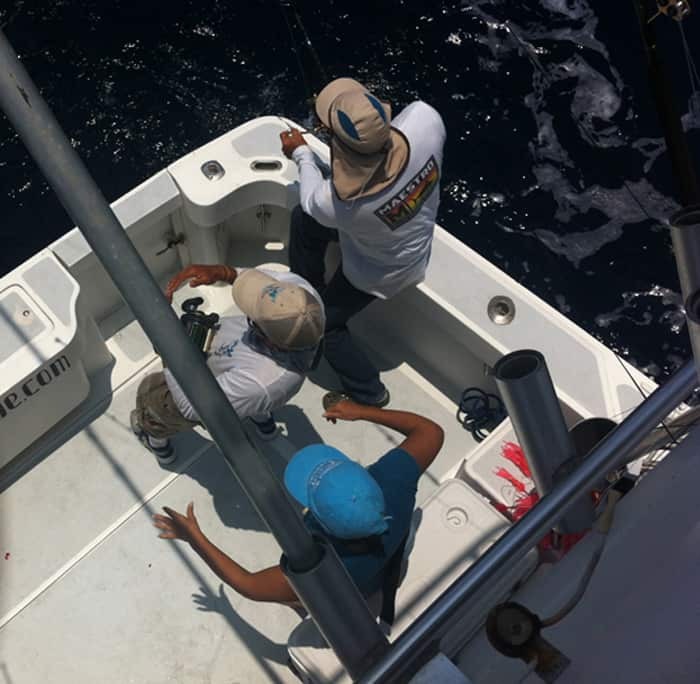 Oscar and Jesús saw the strike immediately and went into catch-a-fish overdrive, grabbing the rod, throttling down and reeling in all other lines. Jesús, holding a rod that was jerking in his hands, signaled to me and I came forward. He handed me a rod that felt like a live anaconda being towed by a monster truck — very squirmy in my hands, and with a lot of power trying to pull it out of them. The fish was far from the boat, but I could feel its every move. It was fast and furious. Someone strapped a fighting belt on me and Jesús showed me how to anchor the rod. I pulled with all the power in my left arm until the rod was curved like a giant fishhook, then I lowered the tip and reeled. The one thing I didn’t expect about catching a marlin was that I had to catch it fast. I was using every muscle in my body to fight this monster. I was sweating, I was stumbling, I was wincing — and they wanted me to do all of this faster. Suddenly my quarry showed himself, flying out of the water twisting and turning, trying to shake the hook. It was a spectacular jump, and I saw it, but I was so busy fighting the fish it barely registered on my consciousness. It was like seeing a double rainbow when you’re about to vomit. I felt like Rocky Balboa — my opponent was pounding the hell out of me, and my trainer kept shouting at me to fight harder. I believe Oscar helped by moving the boat closer to the fish — if the mountain will not come to Muhammad, then Muhammad will go to the mountain. The fish sometimes helped too by swimming toward us, but sometimes he swam in the opposite direction, dragging out a bunch of line I had just labored really hard to reel in. But I kept pulling and reeling, and then pulling and reeling faster, and finally we could see our prey just under the water next to the boat. 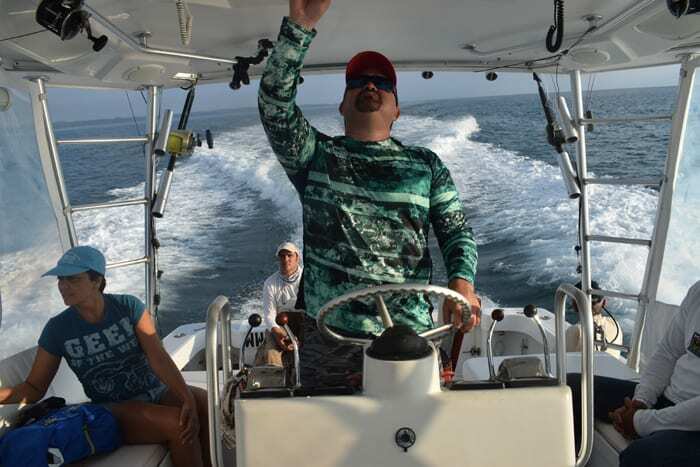 Under Costa Rican law, all marlin or sailfish caught by sportfishermen have to be released. This is done in the water beside the boat — no, you can’t pull the fish out of the water and hang it by its tail for a picture, or you’ll kill it. 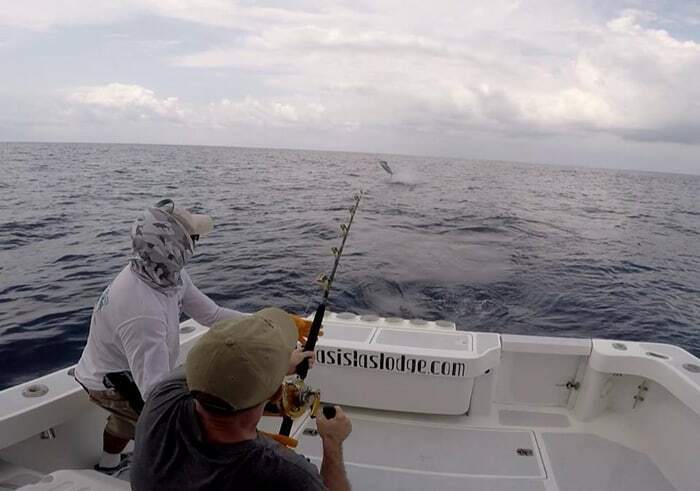 Jesús bent down to try to free the marlin and it made a desperate last attempt at escape, but I had it on a pretty tight leash and all it could was swim to the other side of the boat. Jesús was finally able to let it go. I was so exhausted I could barely lift the celebratory beer with my trembling left hand. I could hardly believe it when Oscar said the whole fight lasted only eight minutes. 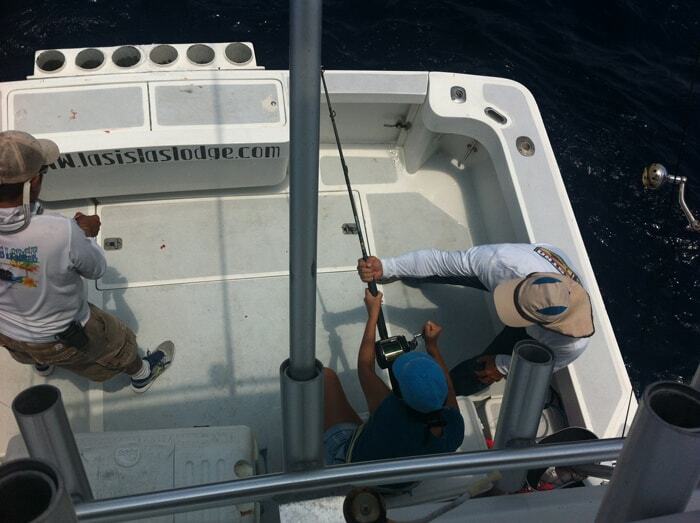 Next thing you know we had another big one hooked, and the rod was handed to Guiselle. 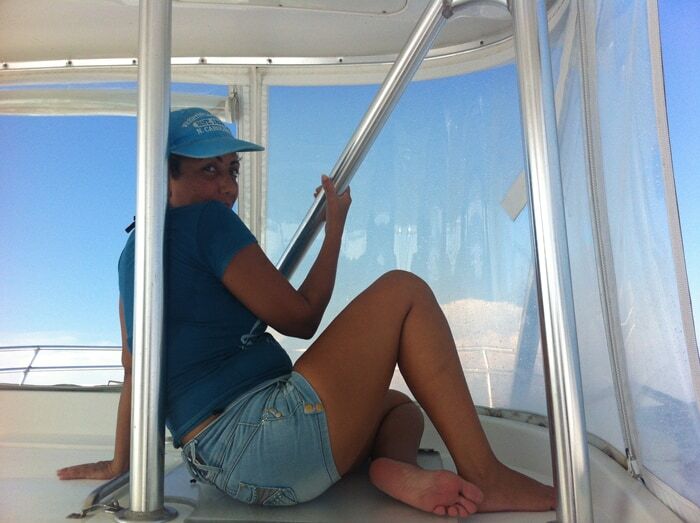 When this happened I was on the roof of the boat perezeando, lazing on a white couch in the shade with the fifth food group, beer. But when I saw Guiselle dragooned into action, I pulled out my phone and started snapping pictures. 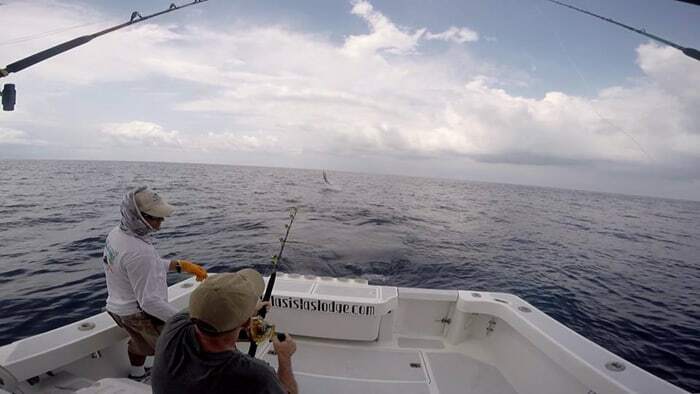 It turned out to be a 120-pound sailfish, which are smaller than marlin but still big, strong fighters. Guiselle did everything I did — staggered, sweated, cursed, pulled, reeled — but she finally asked someone else to take the rod. Michael Palazzo, 67, stepped in and finished the job in short order. Todd Staley, fishing director at Crocodile Bay Resort, bought me a beer and explained to me the inshore and offshore fisheries here, saying the place was world-famous for sailfishing. “There’s a quite detailed scientific reason that has to do with oxygen in the water,” he said, “but it’s the same population of sailfish that swim between Ecuador and Mexico. It’s all the same group of fish. 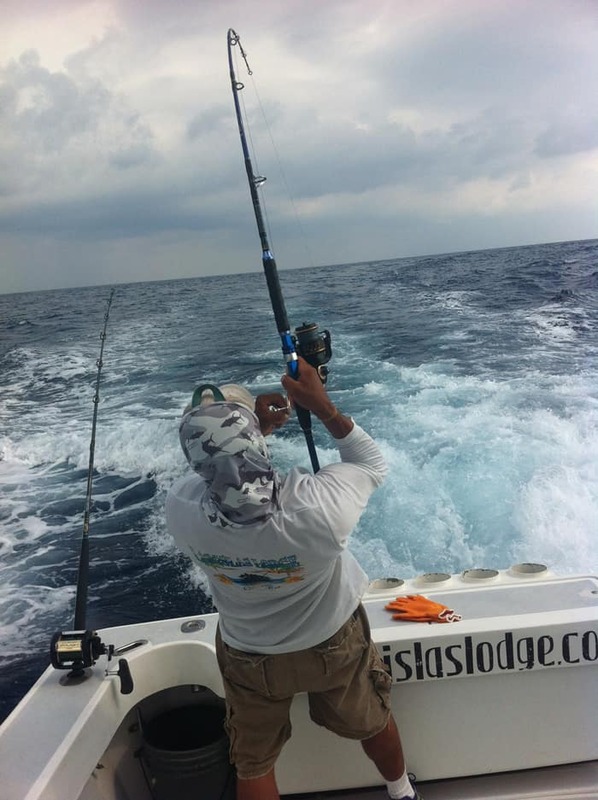 The marlin fishing is also excellent here, peaking in November to January, he said. 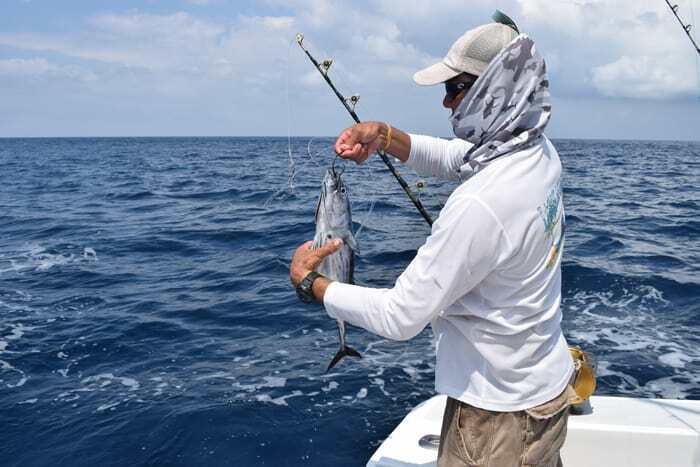 Sailfish here average 80 to 100 pounds and marlin 200 to 400, with the big ones in the 500 to 600 range. Other top species are tuna, dorado (mahi-mahi) and occasionally wahoo. 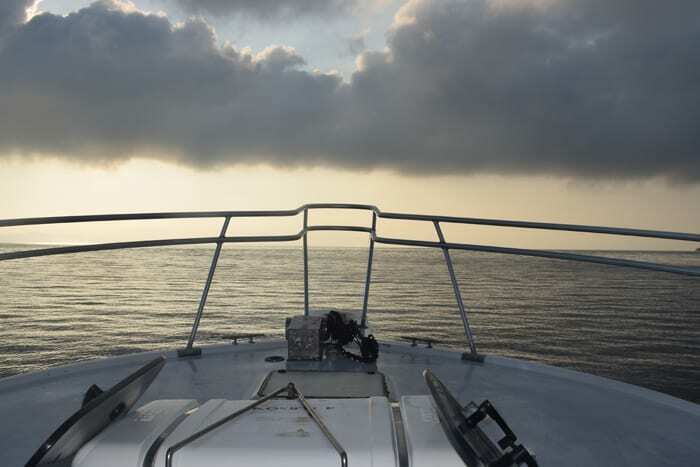 This area is also justifiably famous for its inshore fishing, which means fishing anywhere in the Golfo Dulce to within about a mile out in the ocean. This gulf is remarkably deep, and it gets deeper the further in you go. Sailfish and marlin caught by sportfishermen have to be released by law in Costa Rica, but Crocodile Bay captains also release roosterfish. Back on the fishing boat, one of our compañeros was a hilarious 73-year-old Spaniard named Alberto who kept us entertained with a string of bawdy jokes. 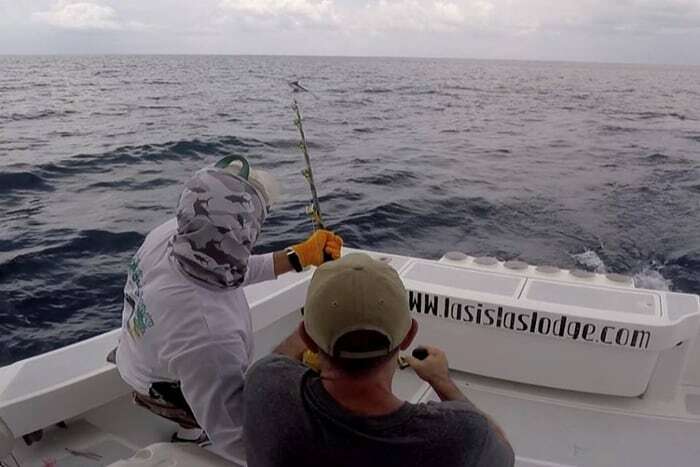 He said he held the record for biggest marlin caught on Oscar’s boat — 1,065 pounds, they estimated, though I don’t know how they estimated so precisely. The captain, Oscar, confirmed that this behemoth took five hours to land, from 3 to 8 p.m., with three people taking turns, but the old man bore the brunt of this battle at sea. “He drank 17 bottles of water and didn’t go to the bathroom once,” said Oscar. Oscar’s 36-foot boat is called the Maestro, and in fact Oscar is well known locally as a master of his craft, not exactly a fish whisperer but a damn good hunter. I asked him what’s the most marlin he ever caught in one day in his boat. “He must be like the Incredible Hulk,” I said. “It’s all in the mind,” he replied. Oscar charges $1,500 to $1,800 for a full day of fishing, depending on the distance traveled. 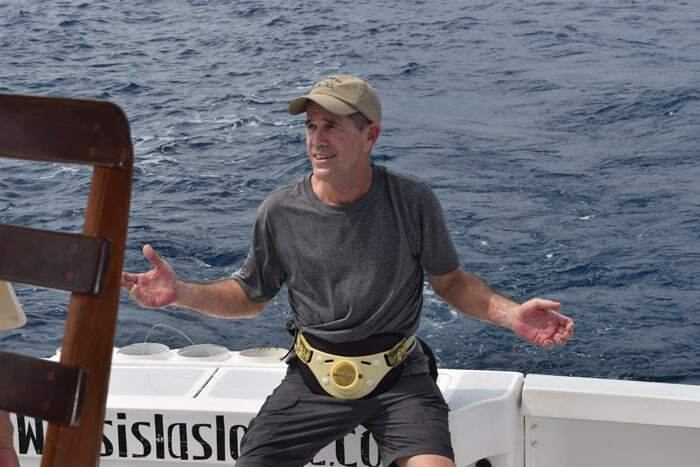 He also does multi-day fishing trips on a bigger boat that can sleep six, traveling 100 miles to a spot where he says they catch an average of 10 to 20 marlin a day. It sounded like a made-up statistic, but one that was probably 99 percent true. In the morning I woke up with a pain in my left arm the size of Texas. The word “sore” doesn’t describe it, more like “megapain,” like I had lifted an entire continent yesterday with this arm and not just caught a fish. Want to go fishing? Contact Oscar Villalobos at 8817-2850, or visit http://www.lasislaslodge.com. Contact Karl Kahler at kkahler@ticotimes.net.